Nikos Michalopoulos is General Director on General Directorate of Administrative Reforms and E-Governance. He has the responsibility to organize, diffuse and monitor the e-gov Public Policy across Greek Public Administration to coordinate the project of digital policy interconnection, re-use of information and open data. In addition to the above he is the representative to the monitor committee of the Programmatic Senior 2014-2020. He holds a Ph.D. degree on Public Administration from the University of Athens and a Master degree on Public Administration from Liverpool University. He was researcher at the National School of Public Administration (in Greece) and expert on Organization and Training at the Hellenic Agency of Local Authorities and Development. He is affiliated with the National School of Public Health, with the National School of Public Administration, with the Interbalkan Institute of Public Administration and with the National School of Security. 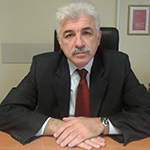 He is member of EUPAN and member of the Board of Governors, EIPA. He publishes mainly in public administration, public management and knowledge management Journals, International Journal of Public Administration, Chinese Review of Public Administration, International Journal of Learning and Intellectual Capital, e-Journal of International Public Management Review and to International Journal of Productivity and Performance Management.